Hello and Happy Vegan Tuesday! :) Oh boy, what a wonderful Thanksgiving weekend! I’m still so full, as I literally spent the entire weekend cooking/baking and eating! We had such delicious food over the weekend. Saturday, we hosted Thanksgiving dinner for Jesse’s family. We did a potluck to make things easier for everyone. I made Roasted Sweet Potatoes with Cranberries and Apples. I also made vegetarian meatballs with a white wine rosemary gravy. It was my first time making gravy and I think it turned out quite well (if I do say so myself!) For dessert, I made a frozen pecan pumpkin cheesecake – which I hope to share with you all this week. Sunday, we had dinner at my parents’ place and again…way too much delicious food. Mom made the usual favourite Thanksgiving items including mashed potatoes, cabbage rolls, and perogies. This year, she also made a vegetarian stuffing with fresh pears. I will have to grab the recipe from her to share before American Thanksgiving. For dessert, Mom made pumpkin pie and pecan tarts. Mmm! The pecan tarts were incredible :) My sister brought a terrific salad to dinner with seasoned pumpkin seeds, pomegranate seeds and pears. It was a huge hit and I hope to post that recipe sometime soon as well. And now…I’m trying to escape the food coma I’ve been in for nearly 48 hours. *hah* I have a feeling we’ll be eating lighter meals for the remainder of the week to offset all of the overindulging we did this weekend. One of my favourite light meals to make is a simple soup. 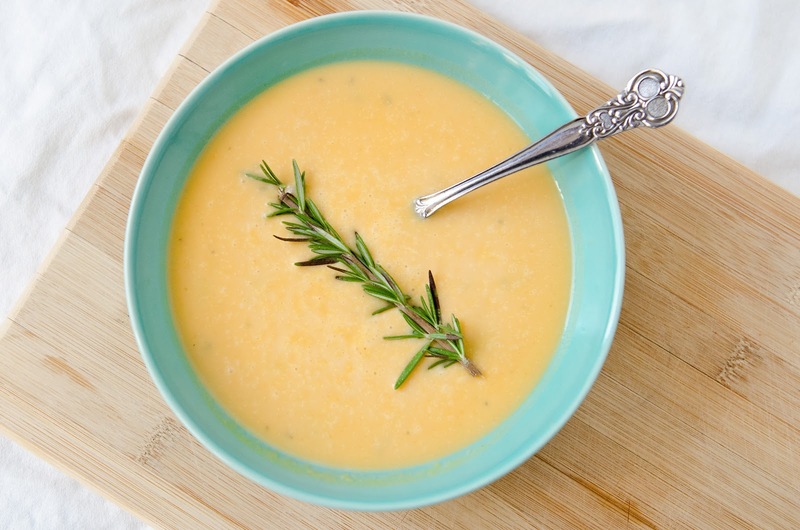 One of the yummiest soups we enjoy is this flavourful, healthy sweet potato rosemary soup. And since the recipe is also vegan , I thought it would be perfect to share for this week’s edition of Vegan Tuesdays. I love sweet potatoes. And I love the flavour of rosemary. They work so well together in this soup. The touch of pure maple syrup is really nice and heightens that natural sweetness of the sweet potato. It’s the perfect, light soup for fall – hearty, but not too heavy. Note: You can use canned coconut milk in this recipe, but be sure not to use more than a small splash. You want the focus to be on the sweet potato and rosemary flavours. 1. In a large saucepan, heat the oil over medium heat. Add the onion and cook until soft (about 4 minutes). Add the garlic and sauté another minute or so. 2. Add the sweet potatoes, rosemary sprigs and vegetable broth. Season with salt and pepper. Bring the mixture to a boil, reduce the heat and simmer until the sweet potatoes are very tender (about 20 to 25 minutes). Turn off the heat and remove the rosemary. 3. Using an immersion blender, blend the mixture until smooth and thick. Add cream or creamer if using and maple syrup. Mix well. Season with salt and pepper again if needed. Keep the soup warm over low heat until ready to serve. Note: Soup can also be pureed by ladling, in batches, into a food processor or blender and blended until smooth. This looks delicious! I am all about creamy fall soups, and I think I will have to add this one to the line up! what a beautiful, silky smooth soup! i love the flavors! It looks so comforting, the color is beautiful. I would just love a bowl right now..! Such a beautiful photo and wonderfully simple recipe! Every dish at your Thanksgiving dinners sounds fantastic – cannot wait to hear more about them in future posts, especially that cheesecake! such a beautiful recipe and beautiful photo! sounds so delicious! I am kinda jealous of your food coma. I was too busy this weekend, partaking in some grueling hiking. I now live in the US, and have started celebrating US Thanksgiving, although it really is too close to Christmas. The soup looks wonderful. That is a delicious looking sweet potato soup, I also like the addition of the maple syrup in there. Thanks for visiting my blog. This is definitively a recipe that I should try. Really like your picture! Sounds delicious – I am craving soup all the time lately, and I love sweet potatoes in any form! Your Thanksgiving sounds like it was full of fun and good food – love the sounds of that gravy you made, and I bet I would have loved your sister’s salad too! What a beautiful, simple soup! I love that you added rosemary to it. One of my favorite herbs! What a beautiful soup! That picture is absolutely stunning, with that one sprig of rosemary on the top! Wow! These are my favorite types of soups – easy, creamy & flavorful! You gave me a craving for this soup. I went shopping tonight and batted zero on the ingredients… Safeway was out of almost everything! Well I still plan to try it. I’m thrilled to hear you and your guests have enjoyed this soup. It’s a hit around home too :) Thanks for the lovely comment.